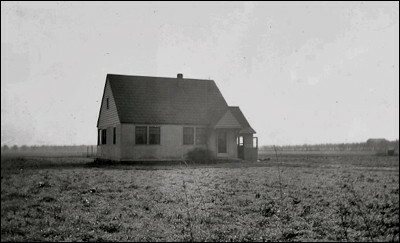 This is the Daugherty home on Kings Highway in Medford, Oregon, soon after it was built in the 1930s. No garage, no chicken coop, no barn, no grape arbor, no frog pond ... no trees! ... pretty sparse compared to the lushly planted farm it would soon become. But you can be sure that the hidden room behind the bookcase was ready for my grandpa's moonshine still! I'm not sure why he continued to make it after Prohibition except that everyone seemed to like it.